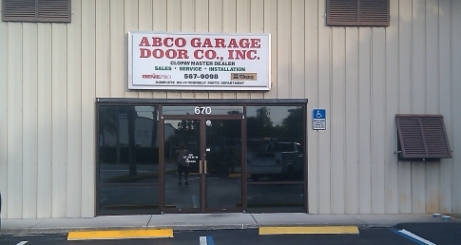 ABCO Garage Door Company, Inc. is locally owned and operated and has been serving Indian River County residences since 1987 in the residential and commercial garage door and opener sales, service and installation industry. All of our garage doors whether replacement or new construction meet all local Building Codes and are LARGE MISSILE IMPACT RATED to meet the Florida Windstorm Certification for your home. Our staff includes full time factory trained field service and installation technicians. Our office personnel provides in-office technical support for all your product needs. For the do-it-yourself customer we have a fully stocked parts department. We are located at 670 8th Court, Vero Beach, Florida 32962 or contact us at (772) 567-9098. Our showroom hours are Monday thru Friday from 8:00 AM to 4:30 PM and Saturdays by appointments. We offer after hours emergency service. We are proud sponsors for Hibiscus Children’s House Foundation, Johns Island Foundation, 4-H Club, Indians Lacrosse Team, Vero Beach High School Softball Team, Annual Toy Run, The Source, SunUp For ARC, Fire Girls Of Indian River County and many others. We believe in supporting the community we work and live in.